Salecia Johnson, 6, handcuffed after tantrum: What’s wrong with this picture? Just as Fairfax County schools is considering major changes to its much-maligned disciplinary policies, a story about a Georgia 6-year-old suggests that zero-tolerance policies remain entrenched across the country — and can lead to evermore bizarre scenarios. In this instance, a little girl named Salecia Johnson had what seems to be a torrential tantrum in her elementary school class. She apparently threw books and toys, tore at wall hangings and threw a shelf that hit her principal in the leg, according to the Associated Press. A school official called the police. Yes, the police. The police arrived. An officer pulled out a pair of handcuffs. He snapped them on the girl’s pint-sized wrists. Police later told the AP that policy mandates they handcuff everyone who is arrested, regardless of age. Those policy-following police then put Salecia in a squad car and drove her to the local police station. There, they gave her a soda and decided against not charging her with a crime. In the wake of the Columbine shootings, the Westside Middle School massacre and other violent incidents within America’s schools in the late 1990s, there has been a heightened awareness of the importance of safety within a school and university setting. According to the National Institute of Justice, more monitoring and awareness of the issue has, at least by one measure, been successful: by 2005, violent crimes, homicides and thefts within schools had all markedly decreased nationwide. It is worth noting that cyber crimes such as attacks on a school’s computer network or attempted hacks on internet school initiatives such as online PhD degree programs, are on the rise. However, this statistical decline is not the only side to the story. Recently, several new studies, which are highlighted within Radley Balko’s article for the Huffington Post, suggest that the methods used for suppressing crime may be overly intrusive. For example: a higher proportion of people under the age of 23 are going to prison than ever before. 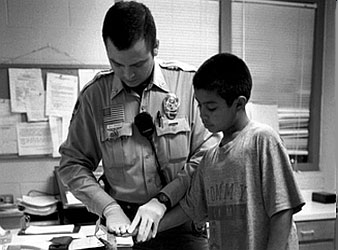 The statistics are overwhelming: in the United States, one in three youths will be arrested prior to the age of 23. Additionally, the number of law enforcement personnel assigned solely to schools has increased by 37 percent between 1997 and 2007 and it is believed that the number of arrests that have originated in schools has also risen significantly in the past ten to twenty years. The result has been a situation where many schools have abandoned their duty to educate and treat difficult children. Thanks to our ramped up “war on drugs,” when I walk in my old neighborhood I see houses where one or both parents are behind bars or on probation or parole. It didn’t use to be that way. Our prohibition policies, and the “us vs. the man” mentality they have caused in our communities, have badly damaged how young black men are perceived — and not just by white people. As an African-American narcotics cop in Baltimore, even I fell victim to fear and apprehension when I encountered a group of black teenagers on the street. Making drugs like marijuana illegal has made them incredibly lucrative, and it’s not hard to see why many teenagers choose to enlist in the dope game and play for the chance at moving up the chain and raking in tax-free money rather than donning a McDonald’s uniform. Even if our drug policies aren’t successful in reducing drug use, they are successful in turning whole communities into criminals. Nearly one in three black men can expect to spend time behind bars. For many black teenagers, getting arrested is a rite of passage. When such a high percentage of children end up incarcerated instead of educated, it is time to challenge ourselves to find real solutions. Every child deserves the right to learn in a nurturing environment, but instead, DISD disciplinary measures set our kids up to fail. 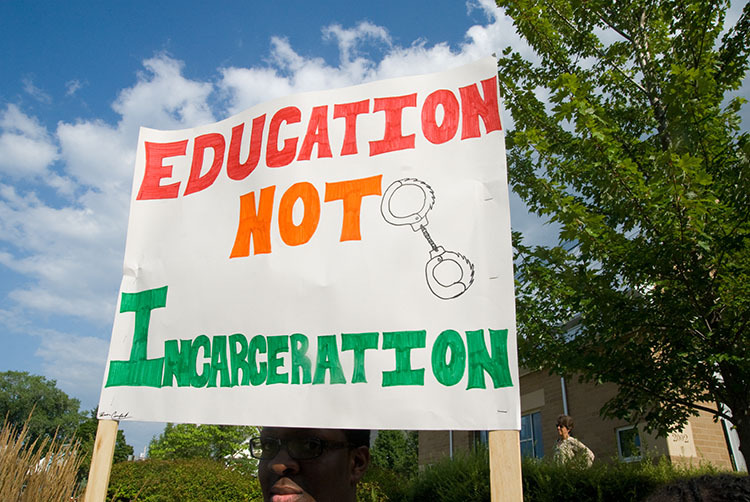 The Coalition for Education Not Incarceration is fighting for positive solutions instead of our schools using juvenile and criminal justice systems to correct student behavior. SIGN THE PETITION to End the Pipeline to Prison in Dallas ISD. Take for example the story of Mr. Stephen King: His son is a senior in High School and a special needs student who cannot read. During a class assignment his teacher asked him to read aloud, and sadly he could not. After feeling ashamed and embarrassed his son left for home. He was written a ticket for leaving school grounds, an infraction that led to expulsion and time in a juvenile justice center. “When a kid feels like he cannot learn, and he is kicked out of school, what options are you leaving him?” asks Mr. King. Concerned parents like Mr. King have been organizing and collecting signatures in support of a Dallas ISD Resolution in Support of Fair and Equitable School Discipline Practices. At the next DISD Board Meeting on December 15th, we plan to deliver the signed petitions to Trustees and demand that they take steps to finding a solution. In addition to appearing at the board meeting on December 15th, we will continue to draw public attention to the gravity of student criminalization. This Thursday, December 8th, concerned parents, clergy, and community members will form a “Human Chain” interlocking arms to symbolically block our children from being thrust through the pipeline to prison. DISD can no longer ignore the necessity for real change. With your support of the resolution, and a strong community presence at the December 15th board meeting, we can end the pipeline to prison in Dallas schools. Sign the petition and stand with us. The Coalition for Education not Incarceration is made up of Texas Organizing Project, Dallas Peace Center, Friendship West Baptist Church, St Luke “Community” United Methodist Church, Paradise Missionary Baptist Church, NAACP, LULAC, Friends of Justice, Center on Communities and Education, CitySquare, People’s Lunch Counter, and Malcolm X Grass Roots Dallas Chapter. A recent report published by the Justice Policy Institute (JPI) reveals that punitive approaches to student discipline do little to curb violence and crime in schools.